Hi all! Hope everyone has had a fabulous Sunday so far. 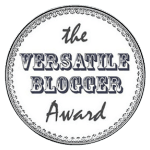 I've been lucky enough to be nominated for The Versatile Blogger Award by the lovely Monika over at Violet Roots. These awards are a way to share the love and your appreciation for some of your favourite blogs to follow whilst having a nosey insight into the lives of those people behind their blog posts. Here are the five short rules to follow for the VBA taken from the Versatile Blogger Awards Wordpress. 1. I was indeed named after That's So Raven actress, Raven Symone when she was in The Cosby Show as a tot. 2. I once winded myself during a school performance of Summer Holiday dressed as Humpty Dumpty and was removed from stage by my mother who was in the audience... not at all awkward. 3. I have relationship fear and have been single for almost 4 years now. 4. My dad is Welsh and my mum was born in Australia. 5. I have been a pescetarian since September 2014 and no, I do not miss meat, and no it does not bother me. 6. My first MSN 'addy' was footyfreak94. 7. I went to Malia for a girls holiday in 2012 and after the first night I woke up on the balcony with my head in a glass fruit bowl and covered head to toe in mosquito bites. Yellow Belle || Into The Bookcase || Flashes of Clarity || Color U Bold || The Sunglasses Effect || Just A Little Bit Ginger ||The Life of a Thinker || Uptown Inspirations || Cake and Whisky. Have fun with it! Can't wait to read what you all have to say about yourselves, too!